Register for OHIO Up Close! People can tell you how great the Athens Campus is, but the best way to know whether it’s right for you is to see it—and experience it—for yourself. You can register for special campus visit programs, regular visit options, group visits, or learn more about how you can plan your visit to OHIO. If you require accessibility accommodations, contact Undergraduate Admissions at 740.593.4100. Special visit programs help you explore your interests and get answers to your questions. Whether you're looking for an in-depth program about your academic interest or want to learn everything you need to know after you're admitted, you'll find a visit program that's right for you. Are you a junior or senior in high school interested in applying to OHIO? Join us for a 30-minute information session and a 90-minute student-guided walking tour Monday through Friday and most Saturday mornings. Times and availability vary by date. Transfer appointments and student-guided walking tours are available Monday through Friday. Group visits include a 30-minute information session and 90-minute walking tour. Dining hall meals are optional. To arrange a group visit, register your group online at least three weeks prior to the requested weekday visit date. Groups must provide at least one chaperone for every 10 students, and the maximum group size is 40 students plus chaperones. 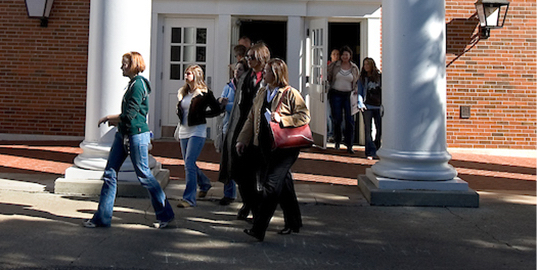 Community college group visits are tailored to your group and could include an information session, walking tour, lunch, meetings with academic advisors, and/or a class observation. We offer community college group visits once a day, Monday through Friday, and the maximum group size is 10 students. Please register via e-mail below to Jodie Van Winkle, associate director for transfer and community college partnerships. You are welcome to visit Ohio University without scheduling a visit with our office. You can also download our etour mobile app to your iPhone or Android phone.